We watched Jon Stewart's last "Daily Show." I must admit, I got a bit choked up! We will miss him. I hope Trevor is good, too. 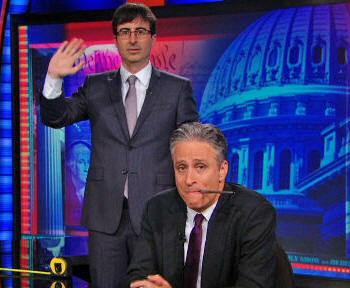 It was particularly great to see John Oliver and Stephen Colbert. We can't wait for the latter's new show. At least they made the finaly episode very funny. Great show, and I hope it wins one more Emmy. It was great to have "Real Time with Bill Maher" back tonight, too. His monologue and the rest was very funny. At least we still have him, and John Oliver! The big news in Daytime TV is that "Days of Our Lives" is about to get really good (in September). They will have a serial killer storyline and shock us all with the bodies piling up. This is how they celebrate their 50th anniversary!!!???!! Okay, first of all, this has been done way too many times on soaps, especially on this particular show. It is never good. Either they kill off someone we really like, or they don't stay dead, or the killer or victim turns out to be some minor character. No matter how they do it (and they usually do it poorly), it's not something we want to see. This is a soap opera. It should be about romance, fun, and family. They need to stop killing people off. This is not fun for fans. Most of the time, the story ends up dragging on way too long and makes no sense. Pardon me for being cynical, but I've been watching soaps since 1984, so I've been there, done that, too many times before. There are a lot of actors on their way out as well as long-time fan favorites returning, so anyone could be a victim. I believe that I read, that the actors who portray Serena, Paige, Aiden, Ciara, and Sonny are all leaving the show. My guess is that Clyde or Ben might also get fired/killed. If they're smart, they'll also chuck that actor who plays Will now because he's just awful. According to Entertainment Weekly (and many other sources, "returning fan favorites include Stephen Nichols, Alison Sweeney, Peter Reckell, Thaao Penghlis, Martha Madison, Tamara Braun, Camila Banus, and more," so any of them could be victims. Jason Cook is also returning as Shawn. Two more joining the show are John-Paul Lavoisier (as Philip) and A Martinez! Meanwhile, over on "General Hospital," Silas has been murdered. YAWN. Why do we care? Yes, we love Michael Easton, but he hasn't had a decent story since he and Sam split up. 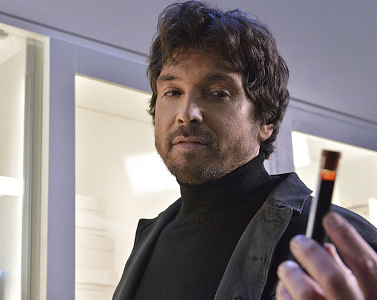 Which of the MANY villains in Port Charles killed him? Does it matter? They won't go to jail. Almost no one does on this show. Or if they do, they don't stay there. If you do care, then make sure you sign the petition to bring Michael back to GH! I know that I may seem very harsh when it comes to my favorite TV shows, especially GH, but that's only because I expect better. The show used to be better, in many ways, back in the 80's and 90's. I love the actors. The actors and the viewers deserve better! We still want less mob stuff, less violence. Get some good drama writers in there that really know how to create realistic conflict without having to bring out lots of guns. Many people I know online are at the GH Fan Weekend right now. I'm sure they're having a great time. I hate them :) No, not really, just kidding. Our associate Nikky is there, taking lots of photos for our site. I finally got caught up a little on our Primetime Reviews! We have a lot more coming up, though. There are just too many good shows to watch on TV right now, and not enough hours in the day. 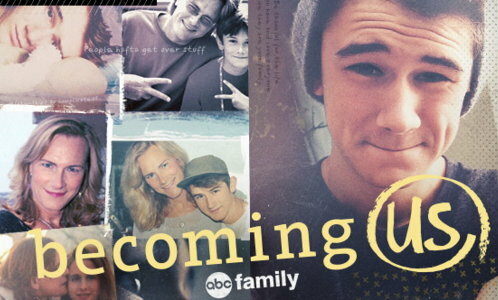 I even like this reality show "Becoming Us," which is about a transgender family in Indiana. I wish I had more time to watch it. 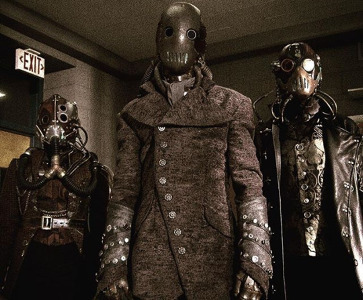 "Defiance" is sure a great show, and every week is still amazing. One of the things they do on this show is come up with these wonderful new characters that are really likable and fun...and then they kill them off. It's always shocking. Every week I can't wait to see it! We still really need a new "Young & The Restless" update writer, especially someone to fill in when Ellen can't do it because she has medical problems. Carole helps out, but she's always way behind. Please email me if you can help out! I wish I could afford to pay someone or had the time to do it myself. Weekends are so boring now with no new TV episodes to watch. I can't wait for the return of "Family Guy," "The Good Wife," "Once Upon a Time," "Doctor Who," and more. Even though I do have plenty of shows to watch on DVD and on my DVR. As always, I worked on our Primetime TV News Page. This week's schedule is here and then, this weekend, I'll be starting on next week's. What shows are you watching this summer? I've mostly been watching "The Whispers," "Beauty & The Beast," "Defiance," "Bold & Beautiful," "The Nightly Show," "Last Week Tonight," "Real Time with Bill Maher," "Major Crimes," "Teen Wolf," and "Rizzoli & Isles." I'm still trying to catch up on "Dark Matter," "Unreal," "Impastor," "Mr. Robot," "Humans," and "Wayward Pines." Plus "The Messengers" and "The Daily Show," both of which are now finished forever (sniff!). "Teen Wolf" has been really intense this season. Those Dread Doctors seriously creep me out. Poor Kira, too. 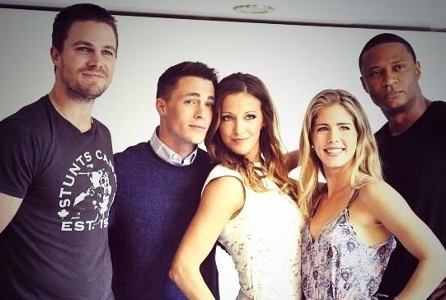 Anyway, I still want to watch "Arrow" from the first season, and write up an episode guide for that. It's tough because I have to watch all of the new shows for review, too! Also, I have three DVD's sitting here to watch: "Hell on Wheels 4th Season," "Rookie Blue 5th Season" and upcoming episodes of "You're the Worst" for FX. I gotta do those first two fairly quickly. I've never watched "Hell on Wheels" before, so I might watch a few episodes from the first few seasons, to get the feel for it. I do so love Colm Meaney, so I can't wait to see him! Great news today - Matt Ryan is going to appear on an episode of "Arrow" this year as Constantine! Yay!!! That will be awesome. I'm so happy about that. We watched last night's "The Nightly Show," and it was hilarious. I hope he can keep that going! We really miss Jon Stewart. Speaking of Jon Stewart, there's a great tribute to him in this week's Entertainment Weekly. 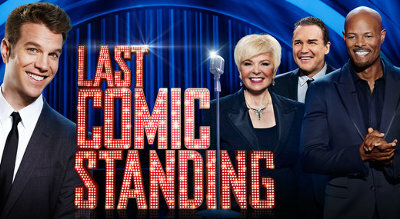 My husband and I both really love comedian Anthony Jeselnik, but we can't bring ourselves to watch "Last Comic Standing." I tried last season, because I thought it might be funny, but it was just too boring. Not enough laughs and too much reality show crap. I'm glad Jeselnik is doing well, though! I hope he can do another stand-up special again soon. He's hilarious. I enjoyed the first episode of "Hell on Wheels," but some parts of it were kind of lame. For instance, you knew one guy was a villain by the fact that he used the N word. And the "hero," a Southerner, doesn't use it and says he freed his slaves a year before the war decided. Ha ha ha!! Totally realistic. Sad to see the last episode of "Major Crimes" until November! Love that show. It was great to see Patricia Wettig again in this past week's episode. Our Primetime Forum manager Danielle is going away for vacation. She does an outstanding job and even did extra work ahead of time so I won't have so much to do while she's gone. She's awesome! Well, all of our volunteers are! "The Nightly Show" was funny again today! Yay! I hope he can keep that up. I was passing by the TV while running the transcripts for "Days of Our Lives" and I saw Marlena and Kristen fighting. I thought, "Wha--? Didn't that already happen?" but it was a promo of some kind. 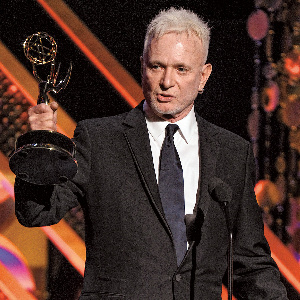 I was reading a Soap Opera Digest article where various actors said nice things about Tony Geary (Luke), since he's leaving "General Hospital." What struck me as odd, though, is that Maurice Benard was not one of them. I wonder why? They worked together a lot. They even got past GH actors to talk about him, and Susan Lucci! I've been enjoying the "Hell on Wheels" DVD. The show definitely improved after its first episode. Now I want to go back and watch the rest of the show...yeah, like I have time! LOL! I watched this week's "Beauty & The Beast", which was good. They have the wonderful actor Jason Gedrick playing a great bad guy this season. He was previously a great bad guy on "Bosch" earlier this year on Amazon Prime. I hope J.T. isn't really going to die! I will be very upset. I've interviewed Austin Basis twice and he's very nice. It seems like every week I watch a new sitcom that is really bad. I don't know why they can't make good ones any more. 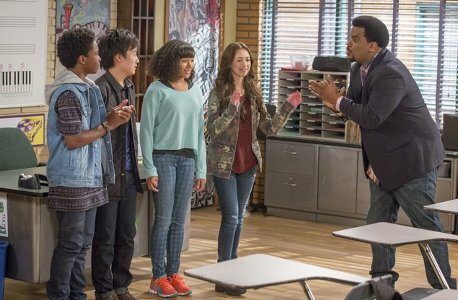 This new show "Mr. Robinson" is not very funny, although it tries very hard. It has some amazing talent in it, like Peri Gilpin, and guest stars like Gary Cole. But it's just awkward and makes you grit your teeth (or, more likely, change the channel). Peri Gilpin is best known for playing Roz on "Frasier." Kelsey Grammer's daughter, Spencer, plays one of the teachers on the show. "Frasier" connection! They don't make sitcoms as good as that one any more, I'm afraid. 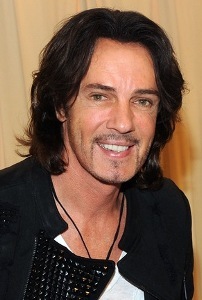 I was also reading a great interview in Entertainment Weekly with Rick Springfield! He's starring in a new movie with Meryl Streep, "Ricki and the Flash." I would love to see it. I hope it does well. A lot of people I know are fans of his, either from his songs or from GH. I don't get much time to go to the movies. I've only seen a couple this year so far, both superhero movies. 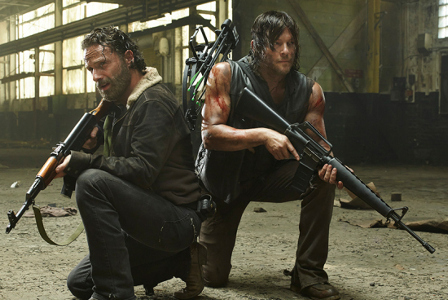 You may wonder why I rarely talk about some of the big shows like "The Walking Dead." Well, I don't like zombies, and I don't like shows that are too gross. It's really a personal thing. I can watch "Supernatural," for instance, without getting too grossed out. I don't know why. Maybe it depends on how realistic it is. Anyway, I was going to watch the new show "Fear the Walking Dead," which takes place before the other one (before the zombie apocalypse starts), but from what I read, it sounds just as bad, so I probably will only watch the first episode to review for the site and nothing more. If can stand that much! There are a lot of shows too gross for me to watch, including "The Strain," "Hannibal," "Z Nation," and "American Horror Story." 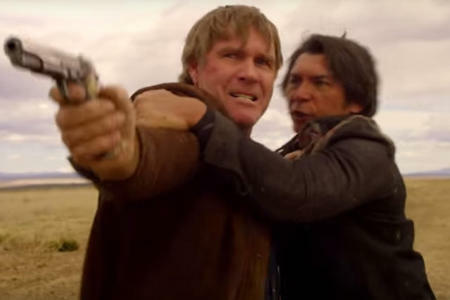 I can't wait for the return of "Longmire" which starts season four in September on Netflix! "Doctor Who" will be returning in September, too. So many good shows coming up... Well, I HOPE that Doctor Who will be good. I was very disappointed in the previous season, and I'm not too fond of the new doctor.